Top Gear’s finale with Jeremy Clarkson, Richard Hammond and James May failed to break records last night when it bowed out with 5.8 million viewers. There had been speculation that the programme, filmed before Clarkson was axed from the show, could reach a new high for Top Gear. 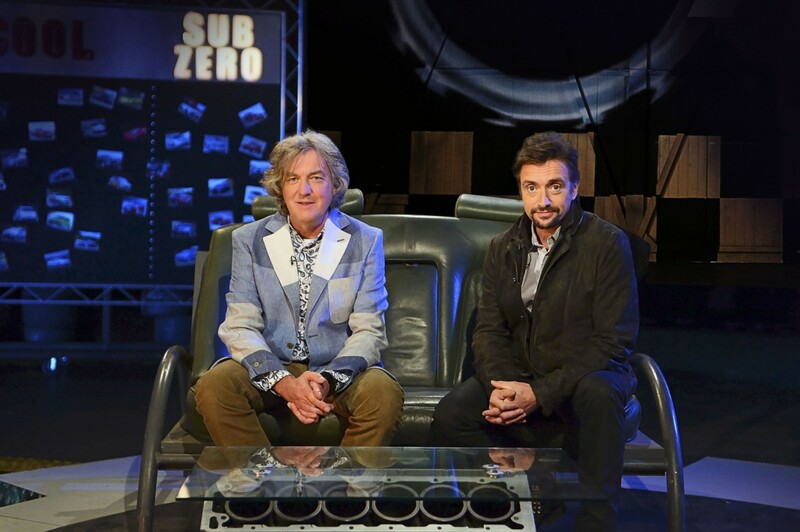 May and Hammond presented from an empty studio without the usual live audience, while Clarkson was replaced by a 10ft plastic replica elephant. After the episode screened, an emotional Clarkson, who was sacked for punching a producer in a row over steak, apologised to fans for the trio’s departure from the show. 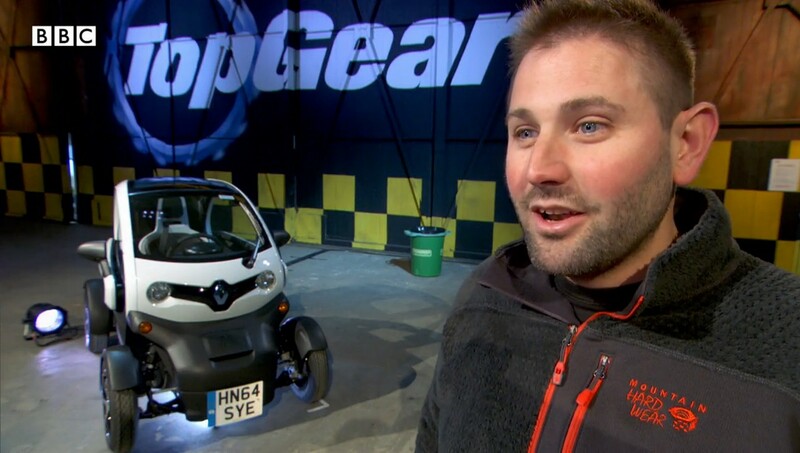 Strange that BBC News is talking down the last Top Gear tonight. Do they not want big ratings for some reason? 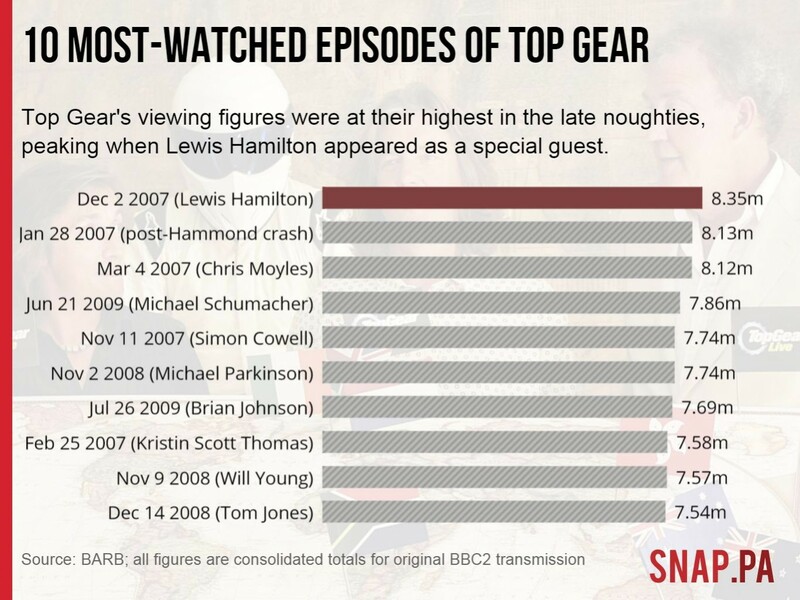 In 2007, Top Gear won its highest ever audience with 8.35 million viewers, featuring Formula One ace Lewis Hamilton. Unlike last night however, the 2007 figure included ‘consolidated’ viewing, featuring live viewing and time-shift recordings but not iPlayer. In December last year, Top Gear’s Patagonia special – the episode which sparked a diplomatic incident with Argentina – was reported to have peaked at 5.11 million overnight. 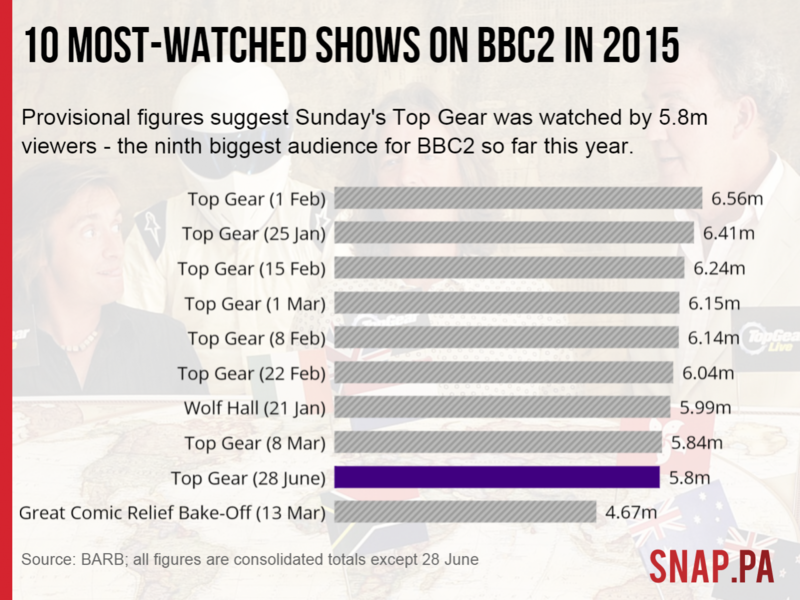 Last night’s Top Gear finale was the biggest programme of the day, with 23 per cent of viewers.  The figures are on a par with overnight figures for the series, before it was taken off air. The 75-minutes of footage for the finale marked the end of an era with Clarkson saying he ‘hates’ working on the show. In a challenge, the trio were tasked with racing across muddy farmlands to reach a black-tie event at Broughton Hall. Clarkson appears to urinate in his tuxedo, saying: “I can’t imagine a urine-soaked pair of trousers is going to put the audience off because…” he explains, gesturing to his mud-covered hands and clothes. The last person to arrive had to give a speech in aid of the North Yorkshire Carbon Management and Sustainability Trust. A scene showing a quiz in a pub with some of the show’s producers had people on social media speculating whether one of them was Oisin Tymon, whom Clarkson fell out with. Other highlights included Hammond being strapped to the top of an aeroplane, his prize for winning their first challenge, involving a classic cars. Top Gear will return with new host Chris Evans next year.